A national nonprofit whose mission is to be a catalyst for advancing beaver management and watershed restoration by providing technical and financial assistance to public and private landowners experiencing beaver conflicts, supporting scientific research, training mitigation professionals, and increasing public appreciation of the beaver’s critical role in creating wetland ecosystems. An excellent nonprofit supporting beavers. Dedicated to promoting coexistence with beavers since 1985. Newsletter available. 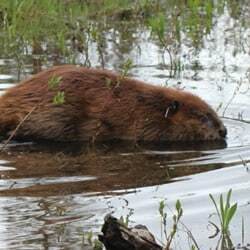 Lists MA beaver laws and regulations, with information for local Conservation Commissions and Boards of Health. “The Clemson Pond Leveler”, (1991). Beaver Management Study – published by the Association of Massachusetts Wetland Scientists, April 2003. Best Management Practices for Beaver Problems – published by the Association of Massachusetts Wetland Scientists, April 2005. Dr. Hood has spent many years scientifically studying beavers and their ability to protect the landscape from climate change and drought. A very interesting and educational read. “The Beaver, Natural History of a Wetlands Engineer”, by Dietland Muller-Schwarze and Lixing Sun, 2003. An extremely well researched and documented book regarding beavers and their importance. “Beavers by the Mendenhall Glacier in Juneau, Alaska”, by Robert Armstrong and Mary Willson, 2009. Beautiful photography taken by the author, and an excellent book for novices to learn all about beavers and their beneficial effects. “The American Beaver: A Classic of Natural History and Ecology”, by Lewis Morgan. Originally written over 125 years ago this book has a surprising wealth of detailed information about beavers, their lodges and dams. Also fascinating is the chapter on Animal Psychology. “Lily Pond: Four Years with a Family of Beavers”, by Hope Ryden. A fascinating book of beaver observations from an author who truly appreciates beavers. 1989. “Where Waters Run Beavers”, by Paul Strong. Abundant color photography nicely complements the text describing the natural history and behavior of beavers. 1997. “Beaversprite: My Years Building an Animal Sanctuary”, by Dorothy Richards. A classic book about beavers which gives many insights into beaver behavior, and how passionate individuals can make a difference. 1983. An interesting and enjoyable story about raising an orphaned beaver by a man with a wealth of outdoor knowledge and experience. 1977. “Beavers For Kids”, by Patricia Corrigan. As the title describes, a delightful book to teach children about beavers. “My Beaver Colony” by Lars Wilsson. The story of a professor cared for reintroduced beavers in Sweden to learn how to better protect them, and to discern what behaviors are learned versus innate. 1968. A good reader about hydrology and various types of wetlands, as well as a field guide to identifying wetland plants and animals. 1998. “Discovering The Unknown Landscape – A History of America’s Wetlands” by Ann Vileisis. An excellent historical text of our nation’s wetlands and how we got to where we are today.1997. “Wetlands: The Web of Life” by Paul Rezendes and Paulette Roy. Spectacular wetland photography and descriptive text combine to instill in the reader a sense of the ecological and spiritual importance of wetlands. 1996. “Wildstream: A Natural History of the Free Flowing River” by Thomas Waters. This 556 page book by offers easy to read, in-depth explanations of stream ecology. 2000.